It is a stunning and frightening statistic: every 30 seconds, somewhere in the world a person is losing a limb to diabetes. Frequently, a minor wound is responsible, although you can argue that for the more-than-25-million diabetics in the United States, there is no such thing as a minor wound when any wound, improperly treated, can lead to amputation. Clearly, the old ways of dressing wounds are inadequate. To learn more about who and what is on the cutting edge of this field, we reached out to Alliqua Biomedical, a company whose core business is in advanced wound care, and spoke with Dr. Janice Smiell. Smiell is Alliqua's Chief Medical Officer and has more than two decades of experience in wound care and regenerative medicine. Alliqua makes a number of types of wound dressings, all based on hydration response technology. 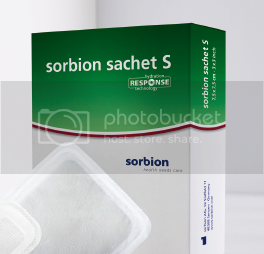 The product we'll focus on is called Sorbion Sachet S.
IAD: What are the primary drawbacks of current or older absorbing wound dressings? Janice Smiell: Older absorbing dressings were foam. Foam just holds the absorbant there and keeps the wound macerated, or soggy. This can begin to break down the healthy tissue around the wound. Other old dressings were the calcium alginates, which often left residue behind in the wound. There are also gels that leave too much moisture at the wound and once again, keep the wound soggy and break down healthy tissue surrounding the wound. IAD: How important is moisture for a wound? JS: You need moisture for a wound to heal, but you need only the right amount. You need a dressing that will provide the right amount of moisture so that any scab can be removed when the dressing is removed without tearing up any good tissue. You also need enough moisture that allows for cellular movement into and on the surface of the base of the wound. This cellular movement is a critical aspect of the healing process. IAD: How does this apply specifically to diabetics? JS: The problem in diabetes is when you get to the point where you know you have a problem wound on the foot for example, the level of bacteria that can build up in the diabetic's ulcer before you see obvious signs of infection is greater than in a non-diabetic. A non-diabetic can fight off bacteria and can show signs of infection before there's a real problem. In diabetes you have several strikes against you. The person doesn't feel their foot so they sometimes don't even know they have an ulcer; they don't 'own' that foot and are therefore less likely to take care of it; their vision may be impaired, preventing them from seeing it; and they don't have the same pain sensations. Finally, their immune response is also not the same as that of a healthy person. This means at the first sign of an ulcer the response needs to be very aggressive. IAD: What are the crucial aspects of that response? JS: You want to battle any contaminating bacteria, get rid of any necrotic [dead] tissue, you want a clean and moist environment, and you want to keep it that way. IAD: How does the sorbion sachet S dressing answer those demands? JS: The sorbion dressing has a covering on it that will pull off necrotic tissue without affecting the healthy cells arriving to help heal the wound. It uses what is called hydration response technology to pull off the bacteria and excess fluid from the wound and then hold it within the dressing using a combination of fibers and gels without allowing it to re-enter the wound. The sorbion dressing also comes in several shapes that can fit around almost any region of the body. IAD: Can we go back to something you said? You said, "They don't own that foot." I'm not sure I've ever heard that phrasing before; can you talk about that briefly? JS: I don't know that it's commonly used phrasing, only that I use it often. When you have a part of the body that is numb, it is almost the same thing as not having it at all. You neglect it. People, for example, who develop nerve issues, can lose sensation in one finger, and unknowingly go for months at a time not clipping that fingernail. In diabetes, before you get to the point where you have the numbness in the foot and the loss of architecture in the foot, it's a good 20 years, depending on how well the disease is controlled. But there are nerves that maintain the small muscles in your foot, and you need those muscles to maintain how the bones fit in the foot. Once you start affecting those nerves, even before you lose sensation, this causes the architecture to change, so you get abnormal pressure points. With those pressure points and the lack of sensation that follows, you can break down tissue simply from walking or sitting or even laying down. You don't sense that you need to shuffle your feet or to move around in the bed, and you start to break down tissue there. On top of that, your white cells are affected and don't respond to the bacteria. Any opening in the skin allows for bacterial or fungal entry; this is why wound healing in a diabetic is so important, not just minimizing the size of the wound but actually healing it completely. IAD: So where is the evidence that Alliqua dressings outperform those older technologies we talked about? Should someone be looking for clinical trial data or is the supporting evidence found elsewhere? JS: In this area, and in the general area of medical devices, clinical trials aren't as relied upon. The studies in these cases come after the product reaches the market, as opposed to before. There is bench-top research and there are case studies; however, there isn't anything like you would see for a drug up for FDA approval. Rather, technology and experience lead to the development of better products, and then their use in the field leads to annual updates, improvements, and small tweaks that are adopted as the product is used more and more by health-care professionals. This is the case with our wound dressings, even though they incorporate decades of experience with wounds. Yet there are still places that use gauze, simply because it's cheap. In the case of the sorbion, there are data from Europe (where the use of these dressings has exploded in recent years) that show that the dressing is as effective as negative pressure wound therapy. IAD: Can the average American diabetic patient expect to find his or her health-care facility using these products? JS: The sorbion has been around in Europe for longer than it has been in the U.S., and has therefore 'caught on' there to the point where it has displaced many of the older technologies. Here in the U.S., it is just starting to catch on.